It’s a question many of us have considered. If we stumbled upon raw young talent in the flesh would we instantly spot its brilliance? And truly realise the importance of what we had witnessed? Would we have stopped in our tracks at a young Chris Hoy speeding along at Meadowbank velodrome? Or a 10-year-old Kenny Dalglish twisting and turning on the salmon pink shale pitches in Glasgow’s East End? On a dull day in April of 1994 I wandered along to Waverley Tennis Club in Edinburgh’s south side to cover the Waverley Junior Open, a Scottish ranking tournament. As the Evening News tennis correspondent, I was searching for players from Edinburgh and the Lothians who were making their mark. But all the local players had been beaten or weren’t scheduled to play – and I still had 200 words to file. This was the definition of a slow news day. And then on a back court in the 12-and-under boys’ singles I saw Andrew Murray, barely as tall as his own racquet with the tennis ball almost bouncing over his head off the crisp astroturf surface. Andy, even at that age, was all angst and self-criticism. Angry at himself for making mistakes or failing to meet his own already impossibly high standards . . . and attracting the occasional ‘tut’ from onlookers for what they considered inappropriate competitiveness. 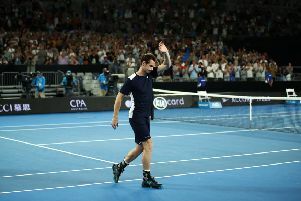 Murray chased down every ball and refused to give up. I wrote that he had ‘displayed remarkable tactical awareness’ – what he lacked in height and strength, he made up for by returning every ball and placing it precisely where his opponent didn’t want it to be. Whenever I watch Andy play – and even in the last week at the O2 against Kei Nishikori and Milos Raonic – I’m reminded of that same determination and tactical awareness. The result? A 6-1, 6-4 win that the defeated Ryan Openshaw later called “embarrassing” but has since managed to put into perspective! I shouldn’t really have focused on Andy at all but it was just a good story, plain and simple: the six-year-old son of a former Scottish women’s champion beating a much older boy. I also think there was also something inside me that wanted that headline – a clipping for my scrapbook, just in case. I knew Judy (she was a former champion herself), and we stood together on the balcony of the club. She was delighted with the result but forbid me from interviewing the victor. He was only six after all. This week, 22 years on, Judy ‘outed’ me on social media as the journalist who gave her younger son his first newspaper headline. It raised that question: did I know back then that I was watching the emergence of true greatness? Of course not. Even Judy has said (publicly at least) that there was no way of realising what lay ahead. Young Andrew lost in the next round of the Open to Edinburgh’s Andrew Hawke but won the under-14s event 12 months later as a seven-year-old. You could say he never looked back, but that would be too simplistic. Back then, Jamie was considered the better prospect. I thought so too, persuading him (at age nine) to partner me in a North Berwick handicap doubles tournament while Andy teamed up with dad Willie. However, in retrospect, what I saw in Andy that day at Waverley 22 years ago was a committed and single-minded young boy who, even if he didn’t go on to become the best tennis player on the planet, wasn’t going to give up without a fight.